The PAHS boys' and girls' golf teams began practicing outdoors last week. Weather permitting, they will start their spring schedule next Monday. Weather permitting, the varsity golf teams for Paynesville Area High School will start this spring seasons next week. Both teams will host ACGC in a dual meet on Monday, April 5, at Koronis Hills, if the course opens in time. Thirty-three students, grades 7-12, are out for the golf team this spring. The teams started practicing outside last week. "I think the girls are going to be very competitive, and I think the boys are going to be much improved," said head coach Todd Knudsvig. The girls finished third in the conference last year, led by two All Conference performers, Heather Fuchs and Amber Jensen. Fuchs, now a senior, was third in the West Central Conference North last year individually. Jensen, a sophomore now, was seventh last year. 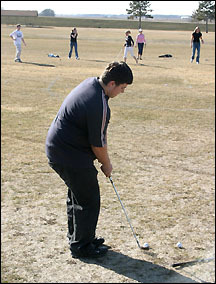 Junior Cody Flanders chips a shot during golf practice on the driving range last week. The girls' team returns all its varsity players from last year plus it has increased numbers this year. The girls have four seniors who have played since seventh grade: Brittany Caldwell, Fuchs, Amanda Glenz, and Jena Spaulding. Another senior, Trish Wendlandt, is new to the team this year. And two new ninth graders, Marissa Mackedanz and Kirsten Miller, could also help the varsity, said Knudsvig. The girls should finish in the top half of the conference again, said Knudsvig, and could challenge Sauk Centre for second, though Albany remains the conference favorite. The girls could also finish in the top two as a team at subsections, said Knudsvig, which would mean advancing to sections as a team. With five seniors on the team, the girls have the experience but will need to keep their focus amidst all the distractions of spring during their senior year, said Knudsvig. "This is their chance," he said. The girls team has 12 players total with four junior high girls expected to play primarily in junior high meets. Knudsvig expects the boys' team, with 21 players this spring, to be much improved. Junior Mitchell Mackedanz, who earned All Conference honors by placing tenth in the West Central Conference North, leads the returning players. Other returning letterwinners are senior Nick Nelson and sophomores Ross Barten, Justin Bork, and Tom Stoneburner. Newcomers expected to contribute to the varsity are seniors Brandon Mackedanz and Neil Symanietz, junior Cody Flanders, ninth grader Cody Burr, and seventh grader Zach Fuchs. A boys' team - Barten, Bork, Fuchs, and Mitchell Mackedanz - advanced to state last summer in the Junior MGA. Their work ethic over the summer is a primary reason for Knudsvig's increased optimism for the team this spring. Knudsvig expects the boys' team to be able to compete with Melrose, St. Cloud Cathedral, and Sauk Centre this year in the conference and hopes the Dogs will be able to avoid the conference cellar, where they have finished the past several seasons.